I don't think I've laughed so hard all throughout a show as much as I did when I saw The Book of Mormon. Well, that's not right, Xanadu had Lani and I in stitches. 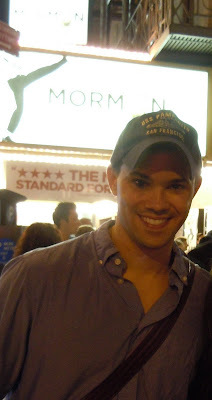 Anyway, I saw The Book of Mormon with Tom a few weekends ago on a Saturday eve (June 4 to be exact). We were lucky we got tickets during previews (we weren't sitting together but it didn't matter) because it's impossible to get them now! It is the funniest, most irreverent show on Broadway today. But I guess that's not surprising being that it comes from the minds of South Park's Matt Stone and Trey Parker plus Ave Q's Bobby Lopez. The story revolves around two wide eyed, newly conferred Mormon missionaries, one the golden boy named Elder Price (Andrew Rannells) and the other an odd ball named Elder Cunningham (played by Jared Gertner that night). The two have been paired together to spread the word to a community in Uganda. Incorporated through all of these are pop culture and theatre throw backs that every fan would enjoy. I really loved how they staged the opening number called Hello with the Mormon missionaries ringing the doorbell and introducing themselves. It's very clever and to book end that same scene in the end is just wonderful! The creators of the show have managed to present something light, silly and shockingly inappropriate fun with sensitivity and heart at the end. I really love the question of faith the Elder Price goes through and that the unlikeliest of heroes emerge from someone unexpected. What a great cast too! Full of energy and joy. 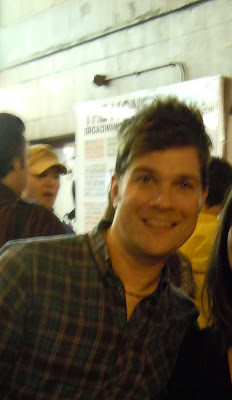 Andrew Rannells has such boyish charm and confidence and a superb voice. Jared Gertner, the Standby for Elder Cunningham, was appropriately inappropriate and funny. They worked off each other really well. Favorite song for me is Rory O'Malley's amusing Turn It Off. What a delight! I also have to mention that I did relish the vocal arrangements from songs such as Hasa Diga Eebowai, Two By Two, All American Prophet and Joseph Smith American Moses. Pat on the back should be given to now Tony winner, Stephen Oremus, the show's music director and vocal arranger. I actually want to see the show again because the whole audience was roaring with laughter, I know I missed a lot from the clever dialogue or song lyrics. I'd have to wait a while before I could see it again but it's something to look forward to in my future trip back to NYC. Addendum (6.25.11): At the show that night were Secretary of State Hilary Rodham Clinton and her daughter Chelsea. check out the lottery for tickets!